“I’ve had times when I really didn’t like what was going on with my points,” Glider Pilot Sarah Arnold said, “but I’ve never had a scary situation. I mean, you have to plan ahead. If you don’t find a thermal, you have to land in a field below you. I’ve landed in lots of fields, but I can’t say that I’ve been afraid of them because I planned well.” She confirmed what I had been hearing, that Thursday in the 2017 R5N contest was an ambitious task, that five pilots landed out and that some didn’t get back to Perry until 7:00. Arnold runs a flying school near Chattanooga, TN, the Chilhowee Glider Port. “Pilots all over the country know where Perry, SC is because of Al and Rhonda Tyler,” Arnold told me. 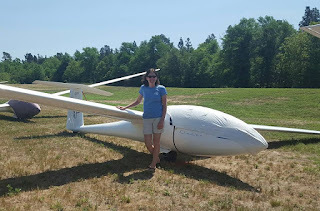 She enjoys the challenge of gliding, how every day is different and a glider pilot in competition never knows what conditions they’ll be facing on the course. In this area of SC, 4,000 – 6,000 feet altitude is expected for a glider. In this contest, 4 – 5 hours in the air is typical. Everything depends on the weather, the thermals. The pilots have an estimated start-time each day, but it all depends on the weather. The Region 5 North contest has four different classes for competition, mostly based upon wing size. 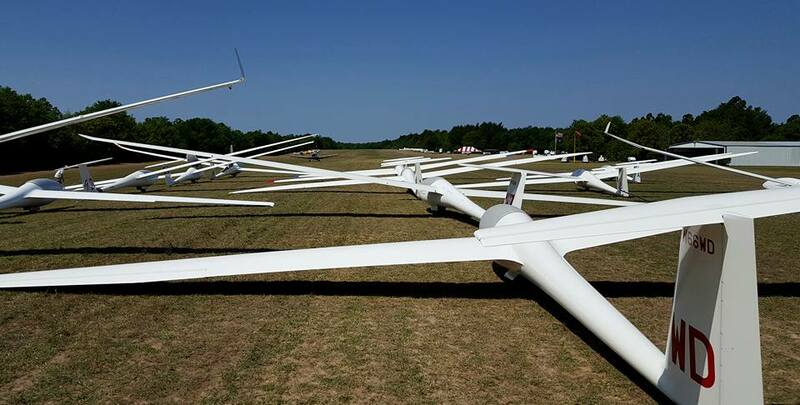 The Open Class has the biggest wing span, 20 meters. Then there’s the 18 meter class, the 15 meter class and the Sports class. Each class has a daily winner. Add up the daily points and the cumulative points for the week is the winner in each class. The Soaring Society keeps the records and a pilot’s ranking helps them get into the busy contests, like Perry’s. Each day, a task is given in each class. The task is to get inside the radius of each designated location which is then recorded on the pilot’s GPS. Each pilot has to complete his task in a certain time frame. Going below the time frame results in a penalty. With a Turn Area Task, the pilot just has to touch inside that area to count. If a pilot is not confident in the weather, he can just touch each area and go, but if a pilot is confident, he can fly to the back of the designated area and fly a longer distance. That is what differentiates the pilots. The task is scored by the total distance and the speed. The speed is the pilot’s time divided by the distance. Maintaining time is part of the challenge, figuring out how to stay up there. The pilot who flies through the strongest thermals and flies through the most rising air from other sources is the pilot who will win. Pilots are passing each other often, navigating mostly with their eyes. Pilots have to infer where to find rising air based on the clouds or something on the ground that might be a source of thermal, but if they see another glider circling and rising, they can just follow and not poke around looking for a thermal. 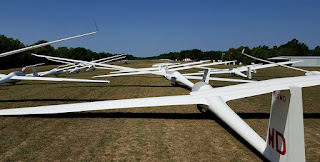 Gliders are fairly low weight and carry water as a ballast. It helps to be light while going up, but once they are up there, it helps to be heavy, to go farther. In some cases, pilots are dumping water early, but normally they try to keep it as long as possible for the advantage of being heavier -- higher speed due to more mass. Sarah Arnold was the only female competing at Perry this year. She is preparing to compete in the Women's Glider Championship in the Czech Republic next month and she has medaled in a previous WGC in France.